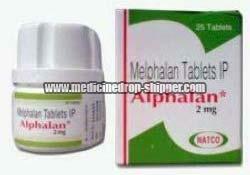 We are a major Supplier and Exporter of Alphalan Tablets in Maharashtra, India. Alphalan is used for treating multiple myeloma, breast carcinoma, advanced ovarian carcinoma, polycythaemia vera, Neuroblastoma, Melanoma, and soft tissue sarcoma. Chemotherapy primarily refers to the treatment of cancer with an antineoplastic drug or with a combination of such drugs into a standardized treatment regimen. Certain chemotherapy agents also have a role in the treatment of other conditions, including ankylosing spondylitis, multiple sclerosis, Crohn's disease, psoriasis, psoriatic arthritis, rheumatoid arthritis, and scleroderma.